Boris Yeltsin was the first president of the Russian Federation, beginning in 1991. 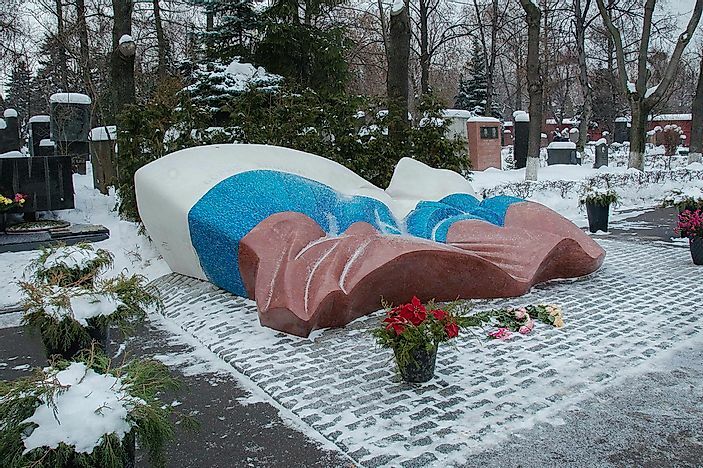 The grave of Boris Yeltsin can be found in Moscow. Boris Nikolayevich Yeltsin was a popular Soviet figure who was also Russian Federation’s first president. Although he belonged to the Communist Party for the better part of his life, Yeltsin appreciated a democratic and free market reforms. He was key to the dissolution of Soviet Union. He contested and won presidential election on two occasions, the first of which Russia was still under the Soviet Union. Despite championing for a free and open society, Yeltsin’s terms were marred by high levels of corruption, economic hardship, violet wars, and increased rate of crime. Within a few years, many of his supporters stated to challenge his leadership. He resigned from the presidency having lost the support of the people. Boris Yeltsin was born in a small village called Bukta in the district of Talitsky in February 1931, in the district of Talitsky. One year after his birth, his peasant grandparents were forced to move away from Butka after the state took the harvest from the collectivized Butka Peasants. They settled in Kazan where his father was hired as a manual laborer in a construction site. In 1937 after the release of his father from prison, Yeltsin joined him at Berezniki where he was working as a laborer while his mother worked as a seamstress. He joined Pushkin High School where his interest in sports such as skiing, volleyball, and wrestling was developed. Yeltsin was a rebellious youth and as a result, he lost two of his fingers, thumb and index finger of the left hand, while holding a hand grenade that he and his friends had obtained from the Red Army supply depot. He got admission at Ural Polytechnic Institute in 1949 where he trained as a civil engineer. During Yeltsin’s tenure as the first secretary of the CPSU in Sverdlovsk, he oversaw the building of a CPSU palace that came to be known as “White Tooth” by the occupants. He committed to the ideal of the Communist Party that in 1981 he was awarded the Order of Lenin. While serving as a politburo member, Yeltsin was considered a reformist and populists. He fired and reshuffled his staff on several occassions. He also fired corrupt officials who were giving the party a negative image. In August 1991, just two months after winning the presidential election, he was confronted with a possibility of a coup against Gorbachev. However, he successfully rallied the mass against the coup attracting praise worldwide. In December 1991 he led two other presidents (Ukraine and Belarus) in announcing the dissolution of the Soviet Union. He also proposed the creation of the Commonwealth of Independent States in place of the Soviet Union. During his first term in office, he implemented several economic reforms including liberalization of foreign trade, dismantling socialism, and raising interest rates to tighten money and discourage borrowing. He also secured billions of US dollars from the International Monetary Fund to support the reforms that were ongoing at the time. However, most of the funds benefited the individuals and not country. Although Boris Yeltsin was a respected politician and leader of the Russian Republic, his private and public life was shadowed with controversies. As an infant, his family had to abandon their home Butka to a far town in Kazan. While at Kazan, his father who was the sole provider for the family was arrested and convicted for anti-Soviet strikes. He also had to live his adult life without two fingers of her left hand, a challenge that some of his close friends thought took away some level of esteem off him. While holding the position of First Secretary, Boris was often frustrated by the slow pace of reforms of the society and opposition from some of the committee members leading to his resignation from the post of the First Secretary. His criticism of Politburo and the Soviet leader, Gorbachev, led to a widespread campaign against him in which his weird behaviors were put to the public. During his presidency, he initiated reforms that were aimed at addressing the country’s deplorable economic situation. However, most of his initiatives like raising tax and interest rates only worsen the situation. He also had to wrestle with the parliament for the control of government and the government policy throughout 1992. He also faced the threat of impeachment in May 1999 before his resignation in December the same year. During his first term as president of Russian Federation, Yeltsin suffered heart disease which continued for the rest of his life. In 1996, he was forced to spend one month in hospital after series of near death heart attacks. His health problems soon became a world focus. The possibility of him dying in office was often a concern to the country’s leadership. On April 23, 2007, he died of congestive heart failure. He became the first president to be buried in a church ceremony. He was hailed as the founder of the new democratic Russia in which the power belonged to the people. Gorbachev described him as a leader had major deeds for the country as well as made serious mistakes.